The End Point Of A Circle: Join The Spin! I’m chuffed to be able to announce the date and venue for the World Premiere of The End Point Of A Circle. It’s been a long time coming. Dom first started filming for the project in 2009, and we’ve been interviewing and filming assiduously ever since. We’ve spoken to Gimpo every year, of course, but it’s been a tribute to Dom’s patience and tenacity that we’ve been able to chat to people like Iain Sinclair and Bill Drummond for the film. Now, finally, we can show people what we’ve been up to. The End Point Of A Circle will premiere as part of the opening ceremony of the Portobello Film Festival on August 29th at the Pop-Up Cinema on Acklam Road, where the Westway meets the Portobello Road. Dom and I will be there to introduce the film, and we’re hoping that a special guest or two will join us. Since 1997, the M25 has been the subject, canvas and location of a unique and unfolding work of performance art. 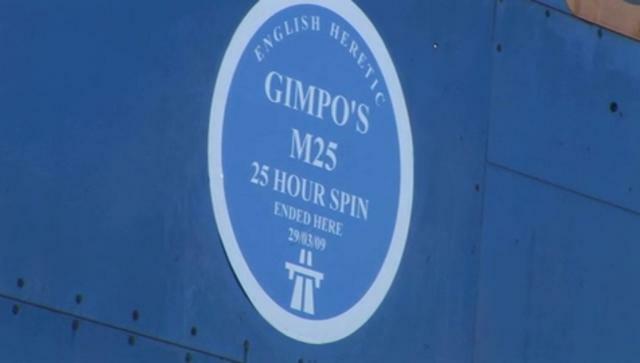 Gimpo, ex-roadie and factotum of Bill Drummond, has driven round the infamous London Orbital for 25 hours, once a year. He will continue to do so until 2021 on a 25- year mission of discovery. Documentarian Dominic Wade, who has already explored the world of extended filming with his raw and revealing film 24 Hours In London, has been given unprecedented access to Gimpo and his world in order to document The Spin. Dominic will be joining Gimpo and his crew every year until 2021 as they seek to find The End Point Of A Circle. Gimpo is an unusual and endearing character, and he’s seen a lot in his many years on the road. He was one of the few witnesses to the K Foundation’s anti- art establishment actions, which led to the burning of a million pounds on the Isle of Jura in 1994. Bill Drummond accompanied Gimpo on the first Spin. Footage of that day was captured by Gimpo on VHS and will be included in the film. Next up, one Dom made a few years ago, that gives a good feel for the tone of the movie. For more on this year’s Portobello Film Festival, grab a copy of the official programme here. Hope to see some of you in West London in a week or so!